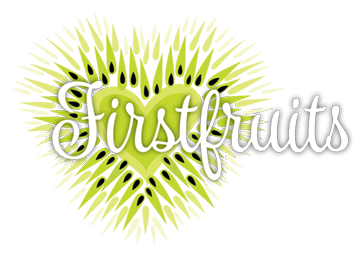 Early on, Firstfruits found itself searching for a logo . . . and what better than a fruit? With a little pondering, the very heart of a kiwi exposed when sliced across the middle would be reshaped into a heart. But not just any heart. The outwardly radiating black seeds bring to mind the image of the Sacred Heart of Jesus that those of us who are Catholic grew up with at home, along with the Immaculate Heart of Mary. Our logo reminds us of God’s infinite, dynamic love for us always!